How do you organize kids? Kids come into the world naturally unorganized. Not to mention they have a lot of stuff that needs to be organized. It’s up to us as parents to organize our kids, then teach them maintain it. You'll never have an organized home if you don't get a handle on organizing your kids and all the stuff that goes along with them... their schedules, routines, toys, school work, etc. The good news is organizing kids and all their stuff is simple. It's about setting up a system of organization that works for them and following through. In other words, make them clean up after themselves. Don’t pick up after your kids, otherwise they will never do it. This is an opportunity for us as parents to teach our kids organizational skills that will benefit them their whole life. It’s really easy to get kids organized if you use the following simple steps. The hard part is to follow through and train kids to put everything in the place you create for it. And, of course, continue to remind them to clean up after themselves! Start organizing kids with these simple steps. Organize kids from their perspective. In other words get down on their level and have a look at their stuff. Bring your kids into the process. Ask them what works for them and what doesn’t. If they can’t reach the closet rod in their closet, their clothes are going to end up a crumpled mess on the floor. Remember to follow the simple rules of organizing… Declutter, categorize, and create a place for everything! Declutter. 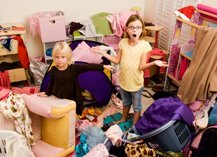 It is even more critical to declutter kids since they outgrow their clothes and toys so fast. Categorize. Be sure to categorize their stuff such as all their clothes, toys, school supplies, etc. Create a place for everything. When you create a place for everything think about what your kids use the most (their favorite toys and books) and organize the storage space accordingly. For instance, organize your little ones so they can easily access their favorite toys and books. Put these items in easy to reach and store places, not high out of the way so they have to, God forbid, climb a book case to reach a favorite book and risk hurting themselves. Finally, label everything clearly. Use a label maker like P-Touch, or if your child can’t read yet, then draw pictures for the labels. That’s it to organize kids… Get down on their level, involve them, declutter, categorize, create a place for everything, organize for easy access of favorites, and label. And, remember it’s critical to declutter your kid’s stuff often, and then organizing kids will be a breeze. Once your kids start to grow and continue to maintain the organization systems you set up for them, they'll lead by your example. They will soon be organizing themselves... the end result, a much more organized and peaceful home life for everyone. For more help on how to get and keep your kids organized, please click on a link below for more organize kids tips. Chores for Kids - learn how to get your kids to do their chores. Chores as Toddler Activities - learn how to have fun and include your little ones in family chores. Home Work Help - put your child on the road to academic success with these tips. Bedtime Rituals - learn how to develop bedtime rituals to keep your family organized and on track.